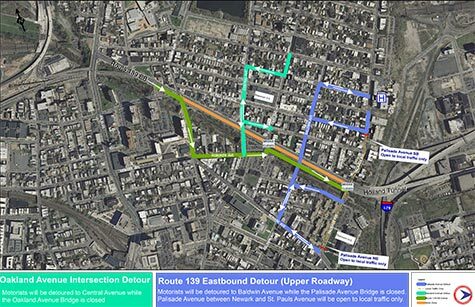 The rehabilitation of the Hoboken and Conrail Viaducts (Route 139 Upper and Lower Roadways) requires the detour of Route 139 eastbound between Summit Avenue and Palisade Avenue. A temporary roadway has been constructed adjacent to Route 139 between Oakland Avenue and Palisade Avenue to carry eastbound detoured traffic. A series of intersection closures is also planned. Affected intersections will be closed in stages. Detour routes will accommodate pedestrians, motorists and public transit. 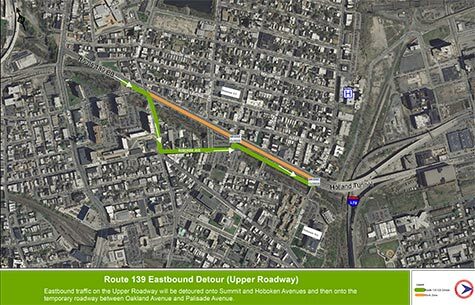 Traffic traveling eastbound on the Route 139 Upper Roadway will be detoured onto Summit Avenue, left onto Hoboken Avenue and proceed onto the temporary roadway eastward (between Oakland and Palisade Avenues). The Oakland Avenue Bridge is closed and is expected to remain closed through Spring 2016. Motorists will continue to use Central Avenue to cross Route 139 until the bridge reopens. Pedestrians traveling south on Palisade Avenue wishing to cross Route 139 will be detoured westward to Baldwin Avenue where they may cross the highway. Pedestrians traveling north on Palisade Avenue and students of Dickinson High School are encouraged to travel west on Washburn Avenue to Baldwin Avenue to cross the highway. Motorists traveling south on Palisade Avenue will be detoured west along St. Pauls Avenue, left onto Baldwin Avenue, south along Baldwin Avenue to Newark Avenue. Motorists traveling north on Palisade Avenue will be detoured west on Newark Avenue to Baldwin Avenue, north on Baldwin Avenue and east onto Beacon Avenue, then turn right or left onto Palisade Avenue. Palisade Avenue southbound between St. Pauls Avenue and Route 139 will be closed to through traffic. Palisade Avenue northbound between Newark Avenue and Route 139 will be closed to through traffic. 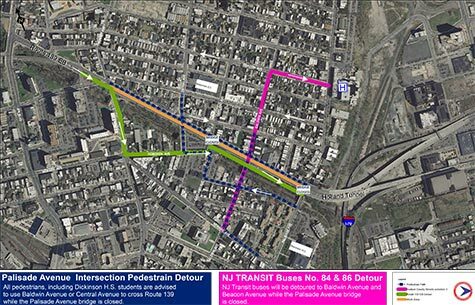 Buses traveling south on Palisade Avenue will be detoured west onto Beacon Avenue then south onto Baldwin Avenue to Newark Avenue. Buses traveling north on Palisade Avenue will be detoured west to Baldwin Avenue then east onto Beacon Avenue. The precise timing of the work is subject to change due to weather or other factors. Motorists are encouraged to follow us on Twitter @skywayrehab and check the New Jersey Department of Transportation's (NJDOT) 511NJ Travel information web site for real-time travel information. NJDOT has a hotline telephone number, 973.776.7400, and encourages anyone who has questions, concerns or suggestions to contact the Project Outreach Team as work progresses.